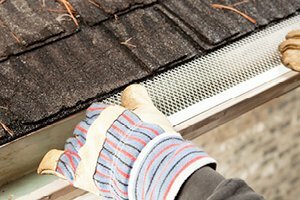 It is always going to be the least expensive option to just get off the couch yourself, take out the rusty old ladder, and scoop all the debris out of your gutter system every fall. But, lets face it, that is the last thing that you want to do. Most people look to gutter guard as if it is a solution to this problem, that they will never have to clean their gutters again. I am here today to tell you that this is not exactly the case. These products are great and will help you various different ways but they do still require some maintenance. If you do not ever want to clean the gutters yourself again then it is best to just hire someone else to do it and forego installing any preventative products. This is what we recommend for our elderly customers or anyone that physically should not be going up on a ladder. Now, if your yard is filled with tall trees you will definitely find a benefit installing gutter guard. We have been out to some houses that are so bad the customer was up there at least once a month cleaning out leaves and sticks. A quality product in this category will keep the debris from actually falling into the gutter, instead keeping it on a “screen” level with the top of the rest of the system so that it can easily blow away with the wind. This design works fairly good, except in a few instances. If the debris is to small, even if is just at a skinny edge like with those helicopter shaped leaves and seeds, they will go right through the screen hole or get stuck in it. Also, if the debris is to wet it will be to heavy to get blown away and can pile up pretty quickly at the edge, causing potential problems. If either of these situations occur, we have had great success simply using a hose to spray the gutter guard and clear the debris. Still a lot easier then actually scooping it all out but nonetheless it is something to consider before you make the investment into a gutter guard product. There are a lot of options when it comes to choosing your new gutter system, all of which you can explore by clicking here.